Cesare Benelli of Ristorante Al Covo in Venice, who shared his recipe with us, makes this risotto with a richly marbled cut of beef; we've found that a meaty short rib works well. Preheat oven to 350°. Meanwhile, heat 1 tbsp. oil in a small oven-proof skillet over high heat. Add short rib and brown evenly, about 2 minutes per side. Remove skillet from heat, place in oven, and roast until meat is crispy on the outside and tender on the inside, about 1 1⁄2 hours. Remove from oven and set aside to cool. When rib is cool enough to handle, remove meat, discard bone, and shred meat. Set aside. Bring beef stock and chicken stock to a simmer in a medium saucepan over low heat. Season to taste with salt and pepper. Keep warm over lowest heat. Heat 2 tbsp. oil in a wide heavy saucepan over medium heat. Add garlic and shallots and sauté until golden, about 2 minutes. Add rice and cook, stirring constantly, until rice is coated and lightly ''toasted'', about 3 minutes. Stir in wine. Cook until wine evaporates, about 1 minute. Reduce heat to medium, add shredded meat and enough stock to cover rice, then stir once and cook until almost all stock is absorbed, about 4 minutes. Add remaining stock, about 1⁄2 cup at a time, stirring once each time and adding more stock as liquid is absorbed. 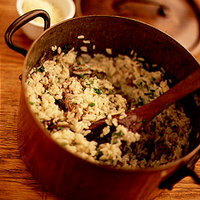 (Make sure rice never dries out and is always just covered by stock.) This process should take about 25 minutes. Just before serving, add parsley, parmigiano-reggiano, brandy, and remaining oil, then lift and shake pan to swirl ingredients together. Let rest for 5 minutes, then serve.